Isn't this too cute? If you look at her Flickr stream she shows the magazine cover that was the inspiration. Too cute! And since I didn't sew a stitch today, I figured I needed the inspirations as much as everyone else. I did get the collar traced out for that baby gift for my daughter's friend. My goal HAD been to get it zipped out so she could take it back with her today. Well that didn't happen. Which means I have to mail it. That is a feat of monumental proportions. Okay, never mind. It is not quite THAT bad. But almost. Later faithful reader, I am headed to bed. Might as well sleep if I am not going to get much else accomplished. It sounds like you've got the winter doldrums. I get that way too when it's dreary out. We at least got snow with it this time. 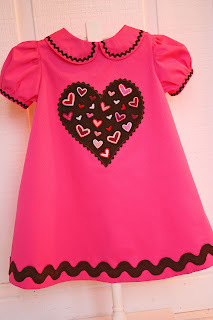 What a delight to find my little dress on your blog! Thank you. Sweet little dress.I detect a bit of cabin fever setting in. You need to go fabric shopping, Martha. Julia, Bunny you are both right. The sun was shining today, thank goodness. Got out ran some errands. Worried ourselves sick over a kid driving back south through the remains of that ice/snow storm. Went grandparent shopping and dinner with a couple of watermelon martinis. Feeling better. Ivey- I love your ideas. I am a great copier, a lousy inventor. So I am glad someone comes up with great ideas for me. That pink dress is adorable. My daughters just saw it, 5 and 9 and they want me to make it for them. Maybe I will. In between nursing my newborn, making a ball gown for a singing performance of mine,and planning one of girl's birthday party!! Thanks for your beautiful blog. I'm glad I found it! This Texas gal is moving with you! Cannot tell you how many times I have pondered what areas are south of here that I might find a warm place where I would be happy to live. But I am not selling the fabric, I am selling everything else and packing the fabric! LOL! LOVE Iveyc95. She is my inspiration for sure!